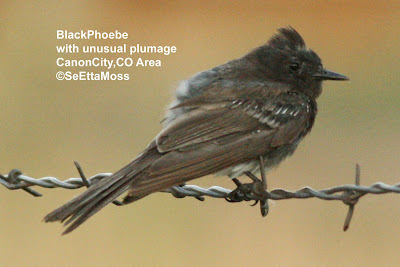 Yesterday I saw this very unusual looking Black Phoebe at my friends place just east of Canon City,CO. I was fairly stunned by the odd plumage on this bird. In the past 15+ years I have seen several hundred Black Phoebes, many of which I have followed for hundreds of hours but I have never seen one that looked like this. That said, I think I understand why it appears to have a 'mohawk' cut on it's crown--I think it has lost several feathers between the smooth feathers just back from it's beak and the very rugged looking raised crest--this gap in feathering accentuates the difference between the forward and rear crown feathers, giving the bird the appearance of having a 'mohawk'. 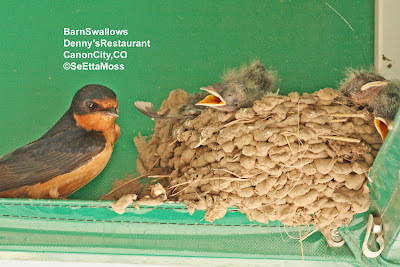 On June 27th I posted about a pair of Western Kingbirds that had it's first nest blown off it's moorings on a utility pole build another nest on the top of an old oriole nest. 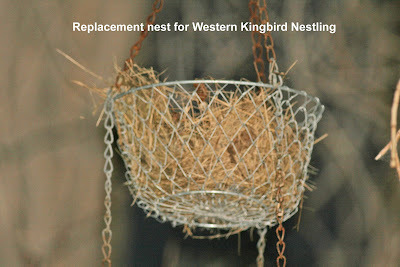 This unusual nest was directly above the entry road at my friend's and where I walk almost every evening with my dogs so I got to watch them frequently. The longer the female brooded on this oddly shaped nest, the more she pushed the nest materials into a kind of elongated shallow trench that was deeper at one end. This causes the nest to point slightly downhill on the other end, a fact that likely relates to what comes next. 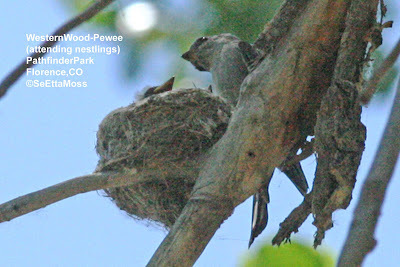 Here are pics of a Western Wood-Pewee, her nest and nestlings in Pathfinder Park near Florence,CO. 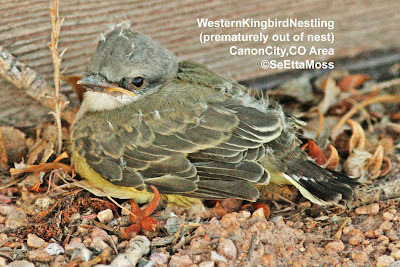 Unfortunately her nest was located high in the middle of a cottonwood canopy which is fairly dark. Because I am handholding the camera I have to use fast speeds which require more light and my 400 mm lens is also a light gobbler, so the pics came out dark.